We included in a prospective study of a standardized indomethacin protocol 134 consecutive patients undergoing primary cementless endoprosthetic hip replacement between January and June 1990. Periarticular heterotopic ossification (HO) was graded according to the Arcq classification (grades 0 to III). At final follow-up, all patients were analyzed clinically and radiographically for HO and aseptic loosening. 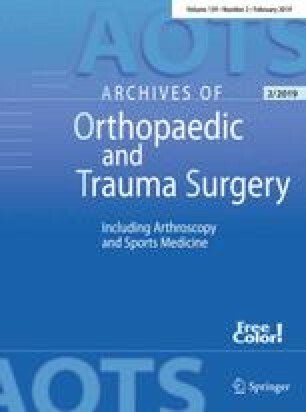 A similar group of 44 patients (mean age of 64 years, range 38–82 years) undergoing total hip replacement (THR) with the same prosthesis and technique in 1987 did not receive HO prophylaxis and served as a control group. The average age of the 134 prophylaxis patients was 66.5 years (range 32–85 years), and the average follow-up was 65 months (range 60–71 months). Thirty patients (25%) were lost to final follow-up (19 died, 10 unknown, 1 amputation). In the study group, 77% had HO grade 0, while none had HO grade III, compared with 18% HO grade 0 and 16% HO grade III in the control goup. These differences were statistically significant (P = < 0.001). At a minimum of 60 months follow-up, clinical and radiographic evaluation revealed no aseptic loosening in the study group: 4 cases of prosthesis subsidence during the first year did not progress. In the control group, there was a higher incidence of radiolucency around the femoral component, and one patient met all criteria for radiographic evidence of aseptic loosening. Statistical analysis revealed no significant difference between the two groups (P = 0.104). Based on our clinical and radiological results, indomethacin does not inhibit stable bony integration of the femoral component.